A new golf book, with a foreword by professional golfer Ernie Els, explores the special connection 54 professional athletes have with the game of golf. “Two Good Rounds-Superstars: Golf Stories from the World’s Greatest Athletes” is the second book in the Two Good Rounds series by author Elisa Gaudet. “This book explores the very special connection between golf and professional athletes from around the world and various sports disciplines,” says the author. “Some of the world’s most well-known athletes give us an inside look at their personal attraction to golf and the fun, uplifting golf lifestyle. A few of the athletes featured in the book include Wayne Gretzky, Tony Romo, Andy Roddick, Michael Phelps, Brandi Chastain, Mike Eruzione, and many more. In “Two Good Rounds–Superstars: Golf Stories from the World’s Greatest Athletes,” these A-list athletes from a variety of disciplines recount their forays into the world of golf and the journey that led them to become industry aficionados—from their best games to life lessons learned on the green. NFL superstars to Olympic heroes also reveal which golf courses they think top the charts and just what it is that makes them so desirable. Anyone who’s serious about golf will enjoy this insider’s look at everything from the athlete’s favorite drink to which venues host charity golf events that simply can’t be missed! Athletic contributors come from many sports disciplines, including the NBA, MLB, NHL, MLS, cricket, rowing, boxing, bullfighting, skiing, skating, surfing, tennis, horse racing, rugby, NASCAR, Formula 1, and the Olympics. 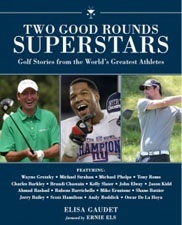 “Two Good Rounds–Superstars: Golf Stories from the World’s Greatest Athletes,” is published by Skyhorse Publishing and will be available in May 2014. The 240-page book retails for $19.95. Happy New Year from RV Life and the 19th Hole!